The Yankees and Angels played a game of full contact baseball that ended with a loud bang by Kendry Morales. In between, the play was so physical that several NFL GMs are rumored to have turned on the game to scout potential late round draft selections. 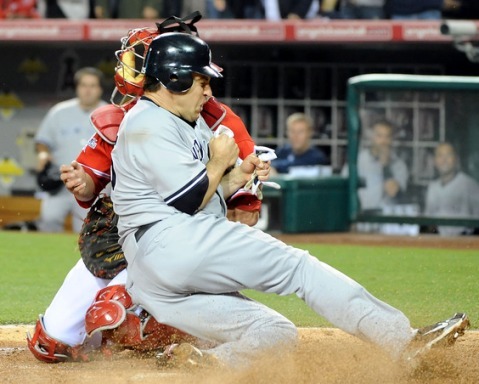 Mark Teixeira crashes into Angels' catcher Bobby Wilson. Teixeira scored the run, and Wilson left the game with a concussion (Photo: AP). Almost from the get go, you could tell that both AJ Burnett and Ervin Santana would not have their best stuff. And yet, both pitched well enough to keep their teams in the game. The Angels jumped out to an early first inning lead on an infield single, but the real action took place in the third inning. Doubles by Brett Gardner and Derek Jeter tied the game, and then hits by Arod and Robinson Cano gave the Yankees a 3-1 lead. On Cano’s RBI single, Mark Teixeira, who had been hit by a pitch earlier in the inning, completely annihilated Angels’ catcher Bobby Wilson, who fumbled Bobby Abreu’s throw from right field and defenselessly turned to tag Teixeira without the ball. It didn’t appear as if Teixeira needed to go in hard, but the impact was certainly felt by Wilson. The Angels’ catcher was forced to leave the game with both a concussion and an ankle injury. In the bottom of the third inning, which featured another small collision between Torii Hunter and Teixeira at first base, the Angels responded with three runs of their own to regain the lead. Just when it looked like Burnett was about to implode, however, he pulled it all together. Nick Swisher re-tied the game in the top of the fourth inning with a solo homerun, and from that point the game remained tied until the 8th inning. The 8th inning is an operative phrase for this game because just the other day Joe Girardi installed Joba Chamberlain as his “8th inning guy”. So, despite seeing Dave Robertson throw the ball well in the 7th, and despite knowing that Morales was 4-6 off Joba, the Yankee manager dutifully went with his new formula. The predictable result was a two-run blast that sealed a well deserved defeat. Aside from the curious decision to go with Joba in the 8th inning, another negative turning point in the game was Brett Gardner’s inability to get down a bunt with runners on 1st and 2nd and no outs in the 6th. Gardner popped out to the pitcher, and a potential big inning was defused. Derek Jeter’s third inning 2B was the 441st of his career, leaving him one behind Don Mattingly for third place on the Yankees all-time list. Brett Gardner’s third inning 2B was his first extra base hit of the season. To go along with the full contact theme of the night, four batters (two on each team) were hit by a pitch and several more were near misses.